Local authority workers in Bristol ignored a court order requiring them to explain why the couple’s two children were being taken for adoption. They only released the information to the parents 45 minutes before the decision was due to be finalised, giving the family no real hope of mounting a challenge in court. 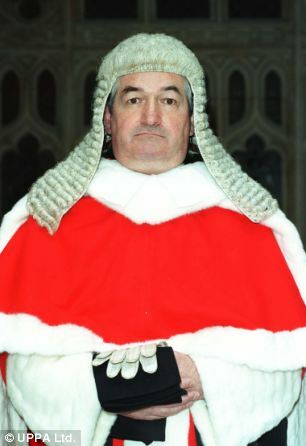 Sir James Munby, who is President of the Family Division, said their behaviour was ‘deplorable’ and ‘symptomatic of a deeply rooted culture in family courts’. In his judgment, he accused the social workers of having a ‘slapdash’ and ‘lackadaisical’ attitude to court orders. He said the couple, who were facing the ‘permanent loss of two children’ had been denied ‘vitally important’ information. He also warned that in future, there would be ‘consequences’ for social workers, suggesting that they could be jailed for contempt if they fail to comply with court orders – an offence that carries a sentence of up to two years. Until now, local authority workers have largely been protected by family courts, which also routinely tolerate delays and inefficiencies in their work. By contrast, members of the public who have failed to comply with court orders have been dealt with severely. The most notorious case of this was the prison sentence for contempt handed down to Wanda Maddocks, who wanted to get her father out of a care home where she thought he was being ill-treated. Miss Maddocks was jailed without representation and in secret until her case was revealed by the Daily Mail. But Sir James’s warning suggests council staff will now face the same punishment as ordinary members of the public if they fail – either through incompetence or unwillingness – to hand over the required information on time. He told the court: ‘That the parents should have been put in this position is quite deplorable. ‘It is, unhappily, symptomatic of a deeply rooted culture in the family courts which, however long established, will no longer be tolerated. ‘The court is entitled to expect – and from now on family courts will demand – strict compliance with all such orders. He added: ‘There is simply no excuse for this. Orders must be obeyed and complied with to the letter and on time. Non-compliance with an order, any order, by anyone is bad enough. ‘It is a particularly serious matter if the defaulter is a public body such as a local authority. Lib Dem MP John Hemming, who has campaigned for openness in the family courts, said: ‘At least anybody who is sent down for contempt by Sir James will not be locked up in secret. This entry was posted in Media stuff of interest and tagged adoption, barraster, bristol, Bristol council, child abuse, childrens act, data protection act, divorce, family courts, James Mumby, judge, legal, lies, nspcc, social services, solicotor. Bookmark the permalink. Hello, I have posted this to start the ball rolling on my new project, I am gathering a team of hackers, Information gathers and people who want to stop this terrible mess and put an end to the money making animals. It’s time change occurs and the right to a family life ( human rights act ) is started to be upheld, It’s got to the point being British means nothing. Hi i am going to stage 2 of the social services complaints procedure about the way my childrens case has been delt with over a year plus. Mainly conserning 4 social workers a team manager. Breifly Illegaly removing my children from my mother when a privite contract in place, ignoring a ro in place in my name. Stopping me having contact with my children because i wanted to enforce the residancy order. Did not work within the ss pyramid structure. Weeks of case laying dormaint with large turn over of staff. Inconsistancys. Can i prosicute named social workers with non complaince with a ro? And illegaly keeping my children from me. 9/11 and 7/7 bombings; what really happened ?? ?